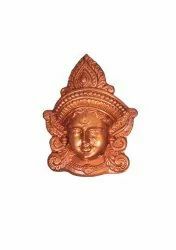 Pioneers in the industry, we offer devi durga face wall hanging- small from India. Presenting before you, a very beautiful Vibrant look wall hanging which adorn your surroundings. Devi Durga is the symbol of power and strength. Waahkart brings this wall hanging with bronze touch, hang this in your temple, hall, office, etc and get her blessings, Good health, prosperity, and positive environment. Gift this to your friends and relatives and let them cherish the beauty of this Wall hanging for a long time. Approx Dimensions: Height: 11 inch, Width: 9 inch, Depth: 2 inch, Weight: 350 gm. Looking for goddess face ?